Smeagol is working on a new post. It will be finished soon, yes, very soon! But now, watch this video we finds! Awesome! This should be on your "About Us" page! Wait... if you fell to your death, are you a ghost now? Maybe it should, precious! Maybe it should. 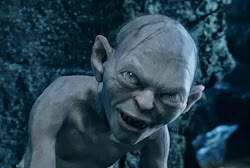 We may have died but the spirit of Smeagol lives forever!